September 11th 2014 This webinar showcases ProAct’s latest unique software-solution capabilities for the planning, management and execution of complex, end-to-end, plant-to-dealer, finished vehicle supply chains. 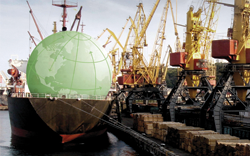 November 26th 2013 26 November – this sponsored webinar, presented by Matthias Berlit, demonstrated how customers such as Volkswagen, Indonesia Port Corporation, and ICO/NYK Line achieved the next level of efficiency by using the yard management system SyncroTESS. June 6th 2013 A webinar that focused on Europe’s largest logistics park and newest deep-sea container port at London Gateway due to open in Q4 this year (2013). This important new facility provides manufacturers, suppliers and logistics professionals in the automotive sector, with a fully automated multi-modal logistics platform, strategically located just 25 minutes from London and the largest consumer market in the UK.